2013 Joni Mitchell Trubute concert poster. Painting by Kirsti Ottem Langeland. 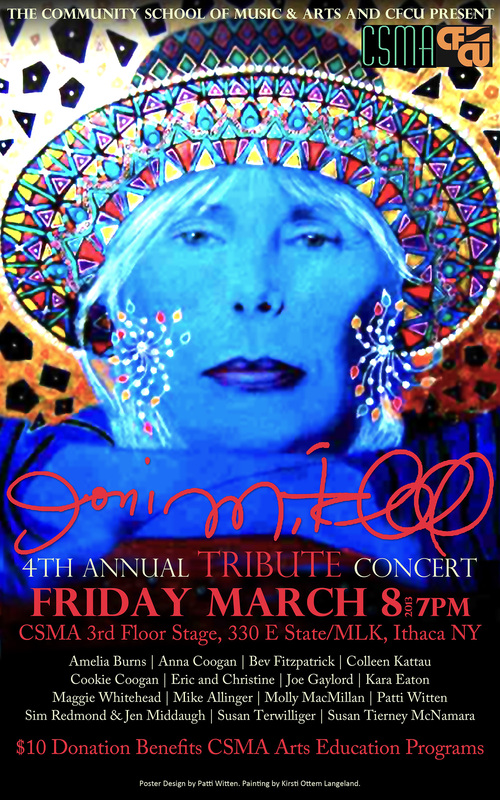 Once again, and I’ve been honored to design the poster for the 4th Annual Joni Mitchell Tribute concert in Ithaca NY (event on Facebook). This year I searched for an image to adapt for the poster and stumbled on a gorgeous painting by the late Kirsti Ottem Langeland. She was a Norwegian born artist who lived in France and painted in the style of Klimt. Her vibrant painting appears to be mixed media using on a well-known photo of Joni combined with paint. I used Kirsti’s painting as the background and added Joni’s iconic, flowing signature and text in Adobe Caslon Pro font. The concert is a fundraiser for Ithaca’s Community School of Music and Arts. I’m also going to be performing — I plan to play ‘Hejira’ and ‘For The Roses,’ title tracks from my top 2 favorite Joni albums. Let me know what you think. Thanks for reading all the way to here. This entry was posted in design, Music, Posters and tagged graphic design, Joni Mitchell, photo retouching, Poster Design, Posters, tribute concert. Bookmark the permalink. I like it a lot. It’s eye grabbing and easy to read. Would posters still be available? Love it!